Dan D’Agostino Momentum Integrated Amplifier review | What Hi-Fi? 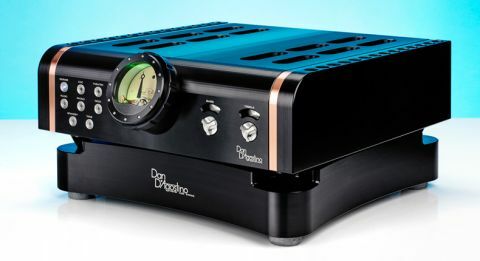 Does Dan D’Agostino’s integrated amplifier have the best volume control in the world? Quite possibly. We certainly haven’t come across anything that matches the beautifully precise and wonderfully damped feel of its rotary bezel or the sheer theatre of that prominent Breguet-inspired level gauge. We particularly love the precisely calibrated movement of the hand on the gauge to the movement of the dial. Small things, but they add up to making the Momentum Integrated something special. And this amplifier certainly needs to be special to justify that huge price tag. It’s configured as a two-box design, where the power supply circuitry is housed in a separate casing to keep all those high currents (and the associated magnetic fields) away from the sensitive audio circuitry. That power supply is sophisticated and truly hefty, packing no fewer than three toroidal transformers into its relatively slim casework. The design keeps the power feeds for the pre, power and control sections totally separate, which helps to minimise any unwanted interaction between and helps enhance performance. Sitting the amplifier on top of the 10cm-tall power supply unit keeps the whole package’s dimensions down into a surprisingly compact unit. The two boxes are linked by a short umbilical. You’ll need a strong support and plenty of ventilation, because together they weigh in at a beefy 55kg. Despite not being a pure Class A design, they generated enough heat to warm our listening room without much effort. As expected, build quality is exquisite. There are two finish options; the black of our review sample or a silver version that will save you £2000 off the retail price we’ve quoted. Whichever option you pick, it will be immaculately made, combining granite-like solidity with a quality of finish more usually associated with top class jewellery. The casework feels immensely solid and is made of panels machined from aluminium billet, while copper is used for the heatsinks due to its high thermal conductivity. These sinks don’t follow the normal fin arrangement but use a venturi design of drilled tubes that run the height of the amp, which (it is claimed) will improve airflow and heat dissipation. All the controls work with well-damped precision, though those for the (defeatable) bass and treble controls require a little too much force to operate for comfort. Overall though, this amplifier is a joy to use, helped by an imaginatively designed but practical remote. If only more high-end manufacturers would take the feel and look of their handsets this seriously. For most people, this is the main point of contact with the product. A look inside reveals the kind of care and attention to circuit layout we’d expect. The engineers have chosen to stick to traditional ‘through-hole’ internal components rather than the surface-mount option many rivals use. D’Agostino claims this design choice brings better reliability and improved resistance to heat. Despite its relatively compact dimensions this amplifier remains something of a powerhouse. The 200W per channel figure into 8ohms is decent, if not outstanding, but this amplifier is strong enough to keep doubling that output until it delivers a whopping 800W per channel into a 2-ohm load. That means it will drive any speaker to high volumes without issue. Impressive. Features are as limited as they usually are for a product of this type. It’s focused on performance not the spec sheet, so we’re not surprised to find little else but a series of line level inputs. Unusually, all six are of the balanced XLR variety, so if you have single-ended sources you’ll need adaptors. There’s no built-in phonostage either, though D’Agostino has announced an outboard unit. If you want to use headphones there’s an output tucked away next to the speaker terminals on the back panel. There’s just a single set of speaker outputs, but they’re chunky and suitably luxurious in finish. Preamp output? What would be the point? Sometimes a product needs days of running before it starts to sing. This one doesn’t. Even the first few seconds of The Unthanks’ Mount The Air show this amplifier to be a truly extraordinary performer. That big power output may lead the listener to expect something of a muscle-bound sound but nothing could be further from the truth. Instead, the first quality that hits home is the subtlety of the Momentum. It has a wonderfully light touch that allows the group’s textured vocals to shine. The song’s low-level nuances and multitude of instrumental stands are laid bare, revealing a stunning level of clarity. Each strand is easy to follow, yet there’s no sense that the amplifier is pulling the music apart. In terms of outright resolution we haven’t come across a superior alternative, regardless of price. The sense of cohesion is absolute. Moving to Arvo Part’s Tabula Rasa, we love the way this D’Agostino conveys dynamic shifts. There’s plenty of muscle when required but the music is always handled with care. As we push harder the amplifier’s excellent sense of scale comes to the fore, as does its ability to render an expansive but well-layered sound stage. Every instrument is locked in position and the presentation remains utterly stable no matter how demanding the piece gets. We wanted to see if this amplifier could have fun and so play Ball and Biscuit by the White Stripes. The Momentum has no trouble here. It’s rhythmically adept, making perfect sense of the song’s insistent rhythm track. There’s plenty of punch too, with the kind of growly, textured yet delicate lows only the very best ever manage. Such is the grip at low frequencies that’s it’s easy to conclude that the Momentum is a little light in this region. But listen carefully and you’ll realise it’s only the amplifier’s exceptional agility in the bass and its class-leading control that make things seem that way. We play around with the tone controls and find them to be subtle and useful. They don’t spoil the sound quality in any notably way and so would be useful in certain situations, particularly with skewed recordings. We fully understand that some people won’t be able to get past the price of this product. Can any piece of hi-fi truly justify this kind of expense? We’re not sure, but we do know that if we were lucky enough to be in a position to buy such a thing we would do without hesitation. It is one of the best amplifiers we’ve ever heard.